You'll have another dream sequence, after which you'll talk to both Carth and Bastila. No conversation choices matter at this time, so just go ahead and say what you wish. Anyways as soon as you exit your hideout you will be approached by a Twi'lek with a message from Canderous. Say whatever you wish and proceed to the Cantina. Again say whatever you wish to Canderous and then proceed to Droids by Janice on the West side of Upper City North. Here you'll need to buy T3-M4 from her to proceed. Try to buy the droid from her at a discount. It is possible to succeed the persuade check even if you have no ranks in persuade, but it will take quite a few retries. The easiest way is to alternate between I cannot afford it and persuade options until she agrees to give you a discount. If you don't mind dark side points you can get the little guy for free by threatening her. In either case you'll get 250 XP for buying the little guy. Give T3 a better weapon (you should have enough heavy blasters) and go to the entrance of the Sith military base. After T3 opens the door for you, you no longer need to have him in your party, but usually I have him tag along for the first room at least. This is because the reception desk has a computer that T3 can access, and with a few spikes can make this base a bit easier. In any case you cannot change your party inside the base so you'll have to exit again if you want to change your party members. Decide who you want with you and enter. The receptionist will confront you, at which point you can threaten her twice for dark side points. If you bribe her or threaten and then let her go then there is no alignment change and she will leave the base without hitting the alarm. Hack the computer, overload the secondary barracks and hack the droid targeting programming using T3 to make this level that much easier. The medical room has a droid that drops a level 2 energy shield and a computer probe for T3M4. Next go down the hall to the next room to meet the Duros that you saved so very long ago when you first arrived on Taris. This does affect your alignment and you get 110 XP so it's best to do something. To let him live hit switches 2, 3, and 4. In order to kill him hit switches 1, 2, and 3. It doesn't matter which side you count from or what order you hit them in. There are other combinations, but these are the simplest. Next loot the small room to the north. For some extra equipment head west down the corridor over to the Armory. Take out the mine and loot the weapons lockers. Next clear the main barracks and the main control center. Go east this time but not into the room directly ahead. Take the side room which should be empty now if you overloaded the circuit in the secondary barracks, and loot the footlocker for the Sith pass card and an improved energy cell. Now prepare for a big battle up ahead. You may want to go back to your hideout to upgrade your gear and heal up. You can also use T3 to take out the assault droid's shields via the Computer. Once you are ready proceed forward. If you've given Bastila the stun droid line of force powers you may want to use that to make the battle easier. Don't depend on it too much as the droid has very high saves. If you can stun it, step back and chuck ion grenades at it to do some good damage. It should go down without too much trouble. Once you are done here heal and rest up and proceed forward. You can threaten the Governor to get some dark side points, but nothing else. If you have anything that grants +fortitude saves is good to equip since the Sith governor will be using Stasis quite a lot. Unfortunately it isn't a mind affect, so being immune to mind affects doesn't help at all. Having Bastila in your party to cast cure is very helpful in this battle. Use grenades as necessary, and if you have scoundrels be sure to flank for that extra sneak attack damage. After a while he should go down. Loot his corpse and the strong boxes for the codes and other goodies. Now that you have the codes, the next stop is Canderous. Now before you talk to Canderous make sure you've completed all side quests that you want, all containers are looted, you've bought everything you want from every store, played Pazaak as much as you want, collected all the Pazaak cards available on Taris if you want, and have done everything else you want to do on Taris because you are never coming back this way again. Warning! This is a point of no return! Unequip every character except for your main character and one other character you want to take with you to Davik's Estate, since their equipment may be useful in the estate. Some things to note before entering is that you can only gain about 3500 XP in his estate if you are at level 8. This means that if you have less than 32500 XP you will want to gain some XP by killing Rakghouls in the Undercity so that you have enough to level up once finished with Taris. Another more costly option is to go around and activate droids and use the computer options that you skipped before. The reason for this is that once you get to Dantooine you will gain one whole level worth of experience. If you have 35999 XP, you will only gain 1 XP, but if you have 36000 XP you will gain 9000! Most people will have quite a bit more XP than 28000 (the level 8 cutoff) and it is unlikely that you will have 45000 (level 10 cutoff), so I suggest shooting for 36000. When it comes to party choice, I usually choose Bastila for her force powers which come in very handy here. After deciding on who to take with you and you are truly ready, talk to Canderous to be taken to Davik's Estate. Watch the following FMV and cut-scene, after which you will have a conversation with Davik himself. None of the dialog choices make any difference so say what you wish. When you regain control equip and level Canderous and loot the footlocker. All of the guest rooms as well as the slave quarters have footlockers that can be looted. Calo's has some good loot you'll probably want. You can persuade the slaves to give you information, but it isn't really necessary. Leave the guest area go across the throne room to the north west hallway. There will be a lone guard patrolling there with a computer passcard on him. Take him out and be sure to pick it up as it allows you to gain access to any computer in Davik's Estate without using computer spikes, though it will still cost you to do various actions. Next enter the Torture Chamber and take the two robots out. These robots use flamethrowers so give one of your party members an upgraded Echani Fiber Armor to reduce the damage. Free Hudrow to get the access codes to the Ebon Hawk. You will still have to go to a computer terminal to unseal the door, but now it will not cost any computer spikes to do so. The Tarisian Noble's room down the hall has some good loot as well so take him out and loot the room. There are two opportunities to get dark side points here, but no light side points. The first is by attacking the Rodian in the guest quarters next to yours. The Second is by killing Hudrow after he gives you the access codes (which can net you an infinite number of DSP if you wish). Unfortunately there are no light side points to be gained. Again there is another point of no return, you cannot explore the base once you have entered the Hangar. When you are ready, proceed to the Hangar with the Ebon Hawk only to be confronted by Davik and Calo Nord. This time it is possible to fight Calo and live. His blasters have been downgraded (thank goodness) and he can be damaged but not killed. In this battle you either have to kill Davik, or take Calo down to half of his vitality. Since both of them immediately activate energy shields, doing physical damage is the way to go. Personally I just have every party member chuck grenades at Calo until the battle ends. You should have quite a few frag grenades by now unless you have been using them consistently. Don't worry if you don't as this battle shouldn't be too difficult. Just focus your attacks on one or the other until they go down. At this point Calo Nord is immune to Critical Hits and sneak attack damage so remember that when you attack him. If your build is focused on sneak attack or critical hit damage target Davik instead. Since they both use blasters closing in to do melee damage is most effective. If you are still having problems use an energy shield on your weakest characters, since they only do energy based damage. After a few hits Davik will die or be killed by Orbital lasers, and Calo will threaten to kill everyone with a thermal detonator, only to have his speech cut short by a orbital laser blast. Make sure you loot Davik's corpse for some unique equipment not found anywhere else. If you have Bastila with you make sure you unequip everything from her, as she will not be available for a while once you get to Dantooine. Enter the Ebon Hawk for several FMVs and Cutscenes. In between all of this is your first gunner station mini game. Don't panic as these are rather easy. For more information click here. After finishing this mini game you will have some more FMV's, conversations, and cut-scenes after which you will finally end up on Dantooine and gain 600 XP to boot. Soldiers: Level 5 & 8, Easy. As long as you make liberal use of Bastila's force powers everything is very easy. Scout (Wisdom): Level 2 & 5 Scout, Medium Easy. While not quite as easy as the soldiers, they will have very few problems, as Bastila and Zaalbar form a very solid front line. Just make sure that your scout doesn't get in the line of fire and you'll be fine. If only level 2 it is even more important to keep the heat off of him, as a few lucky shots can kill him. Use energy shields if necessary. Combat Scoundrel: Level 7 & 8, Very Easy. Now that you have Bastila, she's going to be the frontline fighter, and these guys flank for massive damage. Very few opponents can last long against this combination. Used the same deal against Davik, Bastila in front drawing his fire, and them in back for a full round of sneak attack damage. He went down in one round once in position. Nice! Scoundrel (Wisdom): Level 5, Medium Easy. Same deal with above, but her low attack bonus means that she doesn't hit often. Keep an even larger distance. Against difficult opponents don't try to flank as that is liable to get her killed. Overall: Easy. Bastila is the key to making this as easy as it is. Her force powers can make this area a breeze if you give her good force powers. 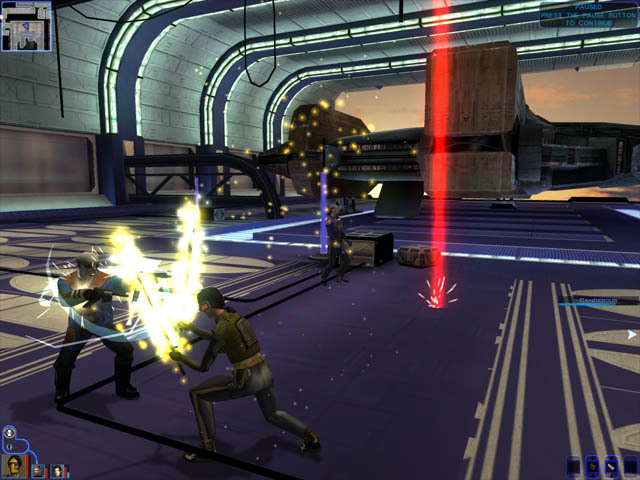 Put her in front, heal when needed, and use Stun or Stun Droid to take down most foes easily. Buff your party with Valor before every major fight, and even the bosses shouldn't be too hard. Make sure you include her in your party to go to Davik's Estate to make it that much easier.